Does your organization have a Vice President of Fan Fundraising™? It probably doesn’t because I just coined the phrase five minutes ago. Fan Fundraising™ will be the next big wave for charities . . . putting organizational structure around the idea of turning your fans, the people who love you, into fundraisers. Fan Fundraising™ will become its own viable channel for marketing, just like direct mail, with income goals and other organization objectives attached to it. All the nonprofits I speak with today want younger donors . . . they want to increase their aging contributor base with tomorrow’s philanthropic-minded. They are attempting to reinvent themselves from old and stodgy to hip and cool . . . they desire to be youthful and progressive. Charities want to reach those Make A Difference Donors I present in Step 16. Fan Fundraising™ connects the organizational dots between offline events, such as walks and ride-a-thons with online campaigns that utilize fundraising tools, such as widgets, personal fundraising pages, blogs and social networks into a cohesive strategy. Just imagine turning the 95% of the people on your constituency list that do not respond to your organization’s fundraising appeals into Fan Fundraisers . . . now that would be something eh? Well if you've completed all the steps up until now, you are ready to inspire your fans to become passionate fundraisers. Here is a Baker's Dozen on how to promote Fan Fundraising™. 1. 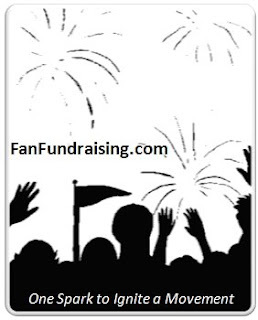 Create a promotional banner advertisement on your organization’s Web site that presents the idea of Fan Fundraising™. 2. Create a print advertisement to be inserted into your charity’s newsletter or magazine. 3. Create a link to your charity’s Fan Page and included in your organization’s email signature. 4. Write a special story about one of your Fans raising money and promote online and offline. 5. Give an award to the top fundraising fans each year and highlight them on your Web site. 6. Pitch your Fan stories to the news media. 7. Create a various pages on social networks promoting your fans and how they’ve made a difference. 8. Keep track of the revenue from your Fan Fundraisers and highlight that in your annual report. 9. In your receipt mailings, insert a slip of paper that provides an easy 1,2,3 step process for people to become fans. 10. Send a special communication to your organization’s volunteers encouraging them to become fans. 11. Run radio spots from your most passionate fans, challenging the listener to join them you in your pursuit to accomplish great things. 12. Send out a post card to your entire constituency base with a compelling image and URL to your Fan Fundraising promotion online. 13. Legitimize this strategy by putting someone in charge of it so that everyday you have a person thinking about Fan Fundraising 100% of the time.